Our number one goal is to satisfy our customers by offering beautiful jewelry products and outstanding customer service. We are grateful for our customers’ loyalty and insightful feedback. We promise to always listen to concerns and to strive for continuous improvement. My wife has been a very happy customer of Vardy's Jewelers for quite a while. Yesterday was the first time I stepped in the shop. I needed to have my wedding ring adjusted slightly to fit right, and expected that I would drop it off and pick it up in a few days. To my surprise, they did the work - perfectly - on the spot. I was incredibly impressed by their quality and service. Fanya and her amazing team replaced a lost wedding ring set. They were understanding, attentive, and patient, as many beautiful options were considered. Vardy's custom-made the new diamond ring to reflect a more modern design, with the goal of bringing more joy to wearing it than the previous set. We cannot thank Fanya and Vardy's Jewelers enough for turning a disappointing situation from losing the original wedding ring, into a truly wonderful experience, that will always be remembered when this new (and improved!) ring is worn. Thank you Vardy's Jewelers! I just had the most incredible service experience at Vardy's. I thought my 20 year old wedding was bent and twisted beyond repair, but Jason did an unbelievable job fixing and polishing it while I waited. I was absolutely blown away. 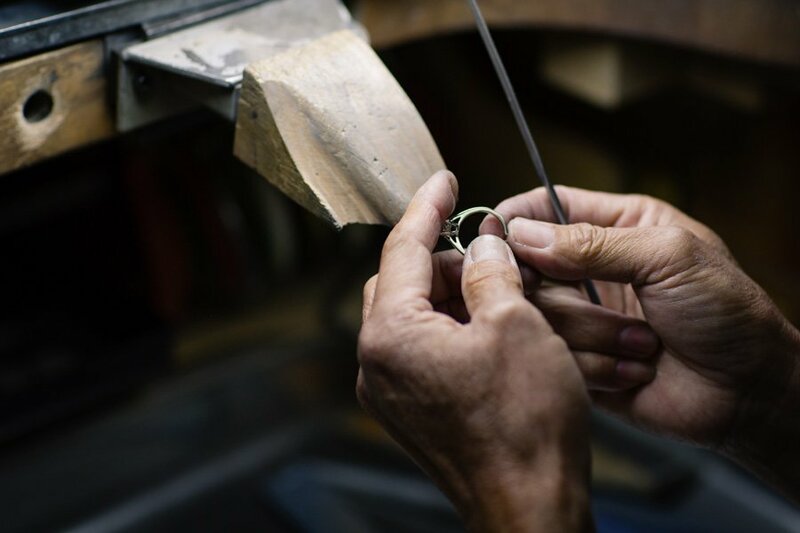 It would be hard to find another jeweler with such incredible technical expertise combined with such friendly service. Thank you! All I can say is exceptional service from Vardy's Team. I can't thank them enough with what they did for me and my ring. My husband Alex and I have been working with Misha since our engagement last year. Went in today to get my rings cleaned and Misha and the staff always go above and beyond to be sure we are taken care of and that my diamonds are looking their best. Misha checks to be sure not only my rings are spotless but any other jewelry I may be wearing is as well. Misha custom made my wedding ring and also did my engagement ring and I am so happy with them both. Whenever we are in the area we stop by to say hello to our friends at Vardys and clean up my rings. I came across Vardy's Jewelers when looking to set a pendant received, into a ring. From the time I walked in the door, everyone made me feel welcome and was extremely helpful. While I had an idea what I wanted (simple solitaire), was shown different designs for halo setting, etc., as well as band options (platinum, white gold....) In the end, stuck with the solitaire setting which was easy. There was absolutely no upsell pressure. Ring was delivered, as promised. Brought diamond earrings in for resetting (lost screw back). Quick turnaround on these, as well. Will definitely come back for continued business. Bonus: they do "wishlists"! Amazing service. I brought in an heirloom ring for resizing and appraisal. The ring was ready in just a few days and looks gorgeous, all sparkly. The appraisal was far more detailed and accurate than one I had obtained from another jeweler last year. This is a family business, everyone is so welcoming and friendly. Mr Vardy looked at another ring I thought needed polishing, and he said he didn't think it was necessary, and he didn't want to take my money! They also have a lovely selection of diamond and gemstone jewelry. I am a customer for life! These folks really care about their customers. So glad I found Vardy's. We wanted to design my engagement ring using small diamonds from my moms ring that she passed down to me. I was looking at local jewelers, and Vardy's was definitely the best contender. I was a little apprehensive because this piece is so special to me, but reading reviews I knew I could trust this team. The customer service here is definitely top notch. I brought in my moms ring, showed them some inspiration, and was able to get a wax model in about 2 weeks and my ring 2 weeks later. Being patient was worth it because they put so much care into this piece that will be with me forever. Thank you so much Vardy's! Wow, the customer service at Vardy's is unrivaled by other jewelers and chain stores. My son wanted to surprise his girlfriend with a family heirloom ring. I wasn't sure it was a good idea but was I wrong. Vardy's changed the original yellow gold setting to white gold which gave it a modern look. It looks brand new, was cost effective for my son, and his fiancée is loving her ring. They did all that in less than a week. They also cleaned and polished my wedding ring set for free while I was there. Amazing results. I am now a Vardy's shopper forever. Also, check out their gorgeous selection of new jewelry, the Hearts on Fire diamonds are spectacular. I will travel from Hayward just to go to Vardy's for my jewelry needs. Yes, I know there are many options closer to me that can provide quality service, but what really sets Vardy's from the others is their welcoming personalities. I've called and visited other places in Hayward, Fremont, Burlingame, and San Carlos to ask about resizing my engagement ring and tightening the prongs around the stone in the past. Some of them wouldn't do it (because the ring wasn't purchased from them) and many responded in a cold and negative manner (again, because the ring wasn't purchased from them). Over the phone and in person, my experience with Vardy's has always been warm and welcoming. You truly feel like you are part of the family when you are there. I brought in my ring, after 6+ months of not wearing it, to get the stones checked. I'd rather go without my ring again than to take it anywhere else. needed to get my wedding ring resized because I've lost 30 pounds and my fat fingers are finally getting skinnier. Vardy's resized it perfectly for me and it looks and feels great. They did a wonderful job and it really is the most satisfying thing to have physical progress of my weight loss.. I stopped in for a repair and I am so impressed with how beautiful the jewelry is and the wonderful customer service I received. I highly recommend Vardy's Jewelers! We worked with Misha on our wedding bands - my husband and I both had very specific requests and were very picky about the way they turned out and stacked together, and Misha was even more of a perfectionist than we were and kept working on making molds until they were perfect. He made us feel comfortable every step of the way and was incredible at listening to our feedback and constantly reworking and not resting until we were happy. He went above and beyond to make the rings perfect for us, and was always in a great mood. We really enjoyed working with him and 100% recommend him to anyone looking for either a custom ring or repair or anything. In addition to making our bands, my mother went in to get her jewelry cleaned and one of the diamonds fell out. Misha was able to not only clean it so it looked spotless but also fixed the ring and tightened the prongs on all of the diamonds to prevent this from happening, with a super quick turnaround time! We're definitely customers for life! Thank you Misha and staff for making our experience one of a kind! I think this is the second review I've ever written in my lifetime. So this tells you if I could give the people at Vardy's Jewelers 10 stars, I would. I had a situation with a local jeweler (not Vardy's) that sold me a Hearts On Fire (HOF) ring under misguided pretenses. And even though they admitted and acknowledged the misrepresentation, they would not accept returns. Since I couldn't return the HOF ring to the jeweler I purchased it from, I decided to reach out to another local HOF vendor -- enter Vardy's Jewelers -- to see if they could help me. . . and YES, they did!! I had the opportunity to work with both Elena and Fanya. Both went above and beyond -- even reaching out to the head of the HOF company to tell them my story. In the end, my happiness was their ultimate goal. Even though it was not Vardy's responsibility to recoup my loss, Vardy's took the HOF ring I had purchased, gave me an additional monetary credit on top of the value of the ring in order for me to get the ring I really wanted -- a platinum HOF fulfillment diamond band. In addition, HOF the company gave me a monetary credit. Has anyone heard of a jewelry store crediting you money to upgrade your ring?!! Anyway, I feel this story needs to be shared. It was in large part the efforts of Fanya Hull, long time professional jeweler at Vardy's, who made this happen. She advocated on my behalf and made sure to stay in constant communication with me throughout the process. She demonstrated accountability, even when it was not her responsibility to. It's evident that the people at Vardy's Jewelers truly care about their customers. . . if you value customer care as part of your jewelry/diamond buying experience, then I highly encourage you to stop by Vardy's!! I've also bought HOF diamond earrings from Vardy's (gorgeous!) and had the pleasure of meeting Mr. Vardy himself during that transaction. We briefly discussed the possibility of making some custom earrings to go with my diamond studs. If you need something custom done, he is open to working with you. . . and what a super nice guy! Excellent customer service. My boy with autism and i visited this place to get one of his pendant repaired and Mr. Vardy was so compassionate and kind to repair it for us free of charge. I have never seen such kind people since a very long time. Also, their diamond collection is beautiful and the prices are very competitive. I will be their customer for life. We took our wedding bands, which were purchased elsewhere, to Vardy's for resizing, and they came back PERFECT. Mine was a platinum band with polish on one side and brushing on the other, and my wife's was a more ornate rose hold design with diamonds. We were warned that hers could be tricky, but it came back flawless. A few weeks ago, I needed my band re-brushed due to some scratching and they did it for us for free, along with cleaning our rings. Everyone is super friendly and helpful here and we really did feel welcomed on each visit. Will definitely coming back for any service, but also if we are looking for new jewelry. I wanted to find a place that could create a one of a kind ring engagement and wedding for my soulmate and this place was the perfect fit! They were helpful walking me through the process and after I proposed and my fiancé said yes I went back with her to have the ring adjusted. Their customer service was as wonderful as their craftsmanship. If your looking for a place that creates a high quality product along with great service Vardys is the place to go. You can feel and see that the customized products are made with passion and love. I have been married for 26 years. I purchased my original wedding rings from Vardy. He and all his staff have always been so helpful and accommodating. My sister purchased her wedding rings from Vardy's Jewelers and was thrilled with her rings. In 2016, Misha (Vardy's son), made my daughter's wedding rings and she was extremely happy with them. In December of 2017, my wedding rings were stolen. I was so upset and immediately called Misha, he reassured me that he could make me a beautiful new ring. Well I received it today and am so incredibly happy with it!!! I can't say enough good things about Vardy, Misha and everyone at Vardy's Jewelers!! Thank you so much!! !